The Jill-E Designs Emma Leather Bag and E-Go Camera Insert Kit from B&H is made for travelling photographers. The Emma bag can hold up to a 11" laptop along with a tablet and the rest of your belongings. Users can also insert the E-Go camera insert for a single-bag travel solution. The camera insert can also be carried separately with the included shoulder strap. 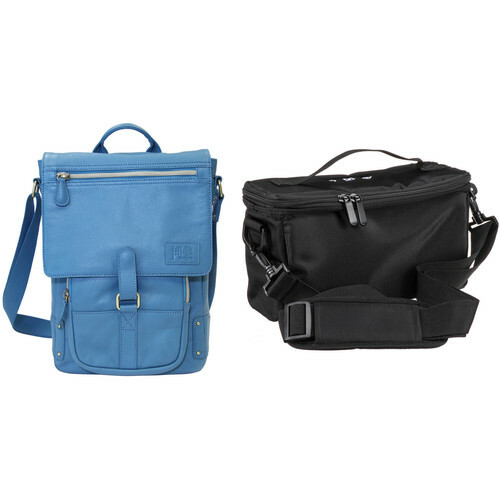 Carry your 11" laptop alongside your 11" tablet in the stylish blue Emma Leather Bag from Jill-E Designs . This close-fitting, cross-body bag offers padded exterior walls and interior compartments to safely house your laptop and tablet. A dedicated smartphone pocket, zippered front pocket, and a flat hidden rear pocket contribute to streamlining your busy lifestyle. Further organize your ID and/or credit cards in the detachable, matching card holder. A magnetic buckle secures a messenger style flap in place over your gear. Carry your bag over one shoulder or lengthen the strap to wear across your body. For quick grab and go, or to carry as a briefcase, take advantage of the top handle. The black E-Go Camera Insert from Jill-E Designs is compatible with Jill-E's E-GO tote, valise, satchel or career bag. Or, it can be used as a standalone bag using its own removable shoulder strap. It can hold a DSLR and one medium lens or two smaller lenses and accessories. Interior padding and adjustable dividers allow you to configure the inside to suit your gear needs. An exterior zippered pocket is provided for accessories. Inside the top lid are net pockets for memory cards and batteries. At only 0.25 lb, this is a lightweight way to add flexibility to an existing bag or as a small shoulder bag for a minimum of gear. Box Dimensions (LxWxH) 17.8 x 13.8 x 4.8"
Box Dimensions (LxWxH) 12.5 x 7.5 x 3.8"